Water Sports Swim Thru Rings are an incredibly innovative and fresh new approach to enjoying your time in the pool. Featuring a set of collapsible rings with adjustable air chambers, Water Sports Swim Thru Rings allow you to change the underwater depth to suit your preference. These Rings are an excellent way of spicing up your swimming routine, while testing your aquatic athleticism. Regardless of individual skill, Swim Thru Rings offer heaps of fun and a challenge for those seeking it. 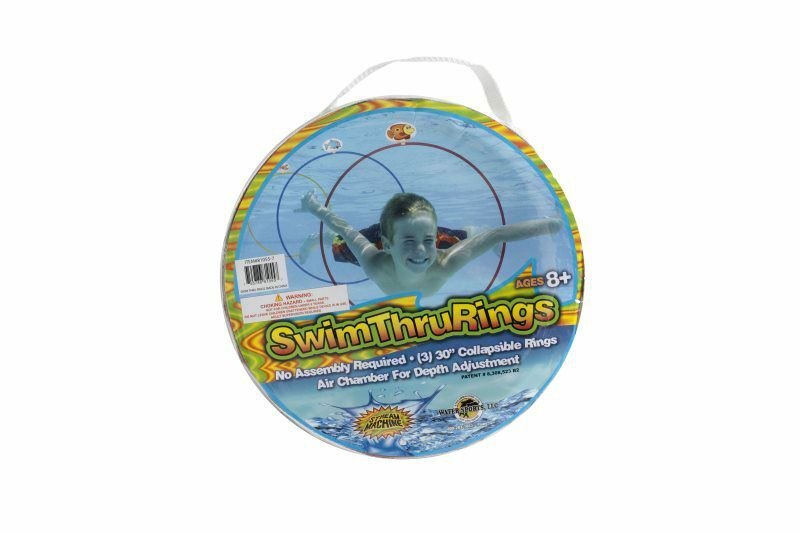 Ideal for tournaments and aquatic games, these rings are capable of transforming any time spent in the water into an engrossing sport. Additionally, Swim Thru Rings are the perfect accessory to utilize in swimming lessons. Innovative swim thru rings are collapsible. Adjustable air chambers allow you to change the underwater depth. Inflatable chambers are decorated with turtles and fish. Perfect for tournaments and aquatic games. Rings turn ordinary swimming into an engrossing sport.